Immune cells express P2 purinoceptors of the P2Y and P2X subtypes. In the present work, we show that three dendritic cell (DC) lines, D2SC/1, CB1, and FSDC, representative of immature DCs, express the P2X7 (formerly P2Z) receptor, as judged from RT-PCR amplification, reactivity to a specific antiserum, and pharmacological and functional evidence. Receptor expression is higher in FSDC cells, a cell line that is functionally more mature than D2SC/1 and CB1. From the wild-type DC population, we selected cell clones lacking the P2X7R (P2X7less). We also used a P2XR blocker, oxidized ATP, to irreversibly inhibit the P2X7R. Ability of P2X7less FSDCs or of oxidized ATP-inhibited FSDCs to stimulate Ag-specific TH lymphocytes was severely decreased although Ag endocytosis was minimally affected. 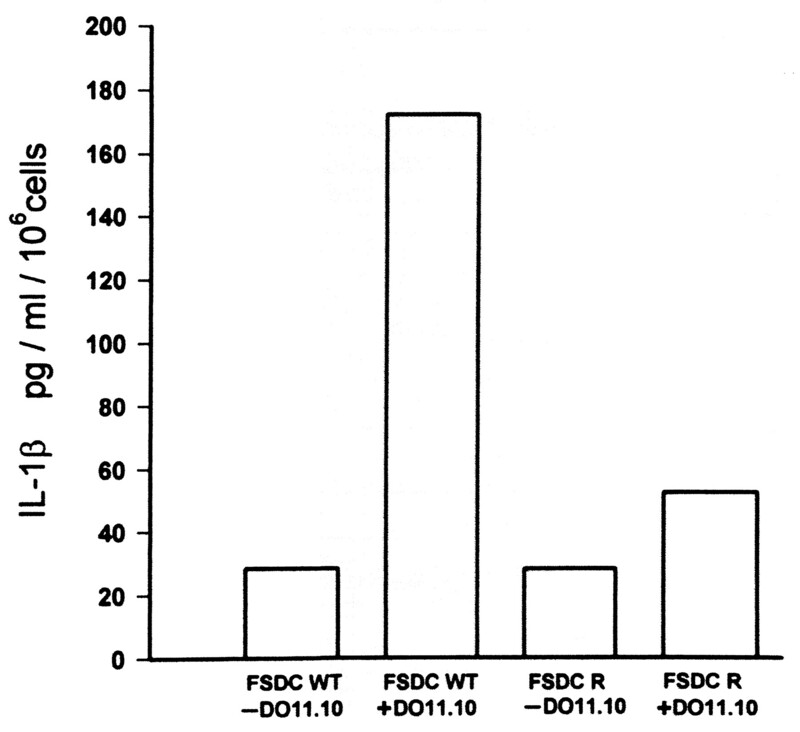 During coculture with TH lymphocytes, wild-type FSDC secreted large amounts of IL-1β. Release of this cytokine was reduced in P2X7less DCs. These data show that DCs express the P2X7 purinoceptor and suggest a correlation between P2X7R expression and Ag-presenting activity. During the last few years, it has been clearly demonstrated that human (1, 2, 3) and mouse macrophages (4, 5) and mouse microglial cells (6, 7) express a peculiar member of the purinergic P2XR family endowed with the ability to mediate the formation of plasma membrane pores. This receptor, which is selectively expressed by members of the mononuclear phagocyte family and by mast cells, was previously known as P2Z; it now has been renamed P2X7 (8, 9, 10). The P2X7R is very probably a multimeric complex formed by the aggregation of an unknown number of subunits each 595 aa long (10, 11). Although it is not known whether other subunits may partake in the formation of the native P2X7 channel, it has been shown that transfection of P2X7 cDNA confers many of the responses of the native receptor, such as ATP-dependent permeabilization (10, 11, 12), cytotoxicity, and fusogenic activity (7, 13), thus strengthening the conclusion that P2X7 and P2Z are one and the same molecule. The most striking effect consequent to P2X7 activation by extracellular ATP is opening of a large pore that allows transmembrane flux to molecules of molecular mass up to 900 Da (8). While the obvious long-term consequence of this effect is cell death, the short-term physiological meaning eludes our understanding. Exception made for anecdotal observations in human Langerhans cells and follicular dendritic cells (DC)3 (14, 15), no thorough characterization has been conducted of the expression and possible function of purinergic receptors of the P2X subtype in cells specialized in Ag presentation. In the present work we investigated the presence of purinergic receptors in the mouse DC lines CB1, D2SC/1, and fetal skin-derived DC (FSDC). DCs are CD45+ leukocytes widely distributed in the body, where they play a major role as APC and in the activation of primary T cell-mediated responses (16, 17). DCs differentiate from myeloid precursors (18), and it has been recently suggested that they may even develop from blood monocytes (19). CB1, D2SC/1, and FSDC cell lines show most of the morphologic, immunophenotypic and functional attributes of immature DC, including constitutive expression of MHC class II molecules, costimulatory molecules B7/BB1, heat-stable Ag, and ICAM-1, and have an efficient Ag-presenting activity (20, 21, 22). By taking advantage of a specific antiserum and an irreversible inhibitor of P2XR, oxidized ATP (oATP) (23), we now provide biochemical and functional evidence that DC express purinergic receptors of the P2X7 subtype. Furthermore, whereas wild-type FSDCs had a powerful stimulatory activity on Ag-specific TH lymphocytes, FSDCs that were selected for lack of P2X7 (P2X7less) or inhibited by oATP were poor stimulants. Our results demonstrate that mouse DCs express a typical P2X7R and suggest an intriguing link between this receptor and Ag presentation. 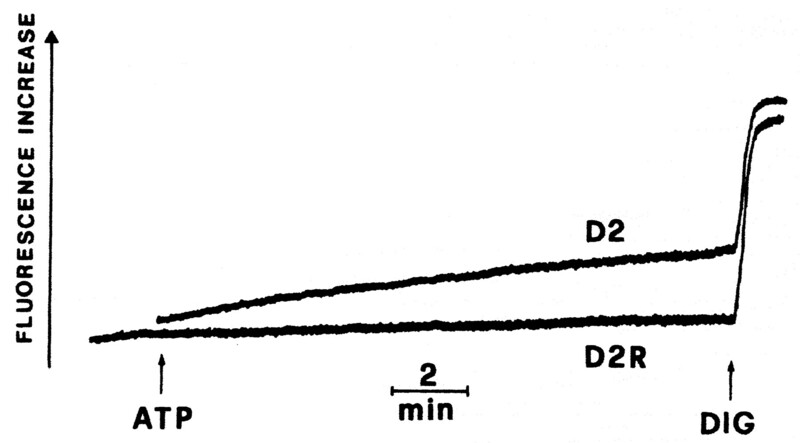 The dendritic CB1 and D2SC/1 cell lines were derived respectively from DBA/2 and BALB/c mice spleen primary culture, immortalized using the MIBψ2N11 retroviral vector, as described (20). FSDC (fetal skin-derived DC) were retrovirally immortalized as described (20, 21, 22, 24). As a responder cell, we used the TH cell hybridoma DO11.10 specific for OVA (25). CB1 and D2SC/1 cells were cultured in DMEM medium (Sigma, St. Louis, MO) containing 2 mM glutamine, 10% heat-inactivated FCS (Life Technologies, Paisley, Scotland), 100 U/ml penicillin, and 100 μg/ml streptomycin. FSDCs and DO10.11 cells were cultured in IMDM (Sigma) containing 5% heat-inactivated FCS (Life Technologies), 50 μM 2-ME (Sigma), 2 mM l-glutamine, 100 U/ml penicillin, and 100 μg/ml streptomycin. The IL-2-dependent CTLL-2 cell line was grown in Iscove’s medium supplemented with 10 U/ml of rIL-2 (Genzyme, Cinisello Balsamo, Italy). Some experiments, when indicated, were performed in a saline solution containing (in mM) 125 NaCl, 5 KCl, 1 MgSO4, 1 Na2HPO4, 5.5 glucose, 5 NaHCO3, 1 CaCl2, and 20 HEPES (pH 7.4). Bone marrow from 8- to 10-wk-old female BALB/C mouse was used. The cell suspension was obtained by flushing the femur with 2 ml of PBS. A single cell suspension was made by pipetting and filtering the cells through a sterile strainer (70 μm). Cells were then plated at a density of 3 × 105 cells/ml in conditioned medium (20 ng/ml GM-CSF) at 37°C. Cultures were fed fresh conditioned medium every 3–4 days. First passages of DC-enriched cultures were performed at day 7. Both suspended and weakly adherent DCs were collected and used for experiments. ATP-resistant (P2X7less) DC were selected by repeated rounds of incubation in the presence of increasing concentrations of ATP (from 5 to 15 mM). This protocol led to killing of more than 95% of the cells. Surviving cells were then cloned by limiting dilution. Changes in [Ca2+]i were measured with the fluorescent indicator fura 2-AM as described previously (2). Briefly, cells were loaded for 15 min with 4 μM fura 2-AM and incubated in a thermostat-controlled (37°C) and magnetically stirred fluorometer cuvette (LS50, Perkin-Elmer, Norwalk, CT) at a concentration of 106/ml in the presence of 250 μM sulfinpyrazone. Intracellular Ca2+ concentration ([Ca2+]i) was determined with the 340/380 excitation ratio at an emission wavelength of 505 nm. ATPe-dependent increases in plasma membrane permeability were measured with the extracellular fluorescent tracers ethidium bromide and lucifer yellow (Molecular Probes, Eugene, OR) (2, 4). For ethidium bromide uptake, cells were incubated in a fluorometer cuvette (37°C) at a concentration of 106/ml in the presence of 20 μM ethidium bromide and challenged with ATP. Fluorescence changes were monitored at the wavelength pair 360–580 nm. For lucifer yellow uptake, cell suspensions were incubated for 15 min at 37°C in standard saline containing 250 μM sulfinpyrazone and 1 mg/ml lucifer yellow, and stimulated with 3 mM ATP. After several washes to remove the extracellular dye, cells were analyzed with an inverted fluorescence microscope (Olympus IMT-2, Olympus Optical, Tokyo, Japan) equipped with a 40× objective and a fluorescein filter. Total cytoplasmic RNA was extracted by the acid guanidinium thiocyanate phenol method. Amplimers for P2X7 were: 5′ amplimer, ATA TCC ACT TCC CCG GCC AC; 3′ amplimer, TCG GCA GTG ATG GGA CCA G. The oligonucleotide used as probe in Southern blot analysis was TTC CTC CCT GAA CTG CCA CC. Amplimers for β-actin were: 5′ amplimer, TGG GAA TGG GTC AGA AGG ACT; 3′ amplimer, TTT CAC GGT TGG CCT TAG GGT. The oligonucleotide used in Southern blot analysis was AGA GGT ATC CTG ACC CTG AAG. Oligonucleotides were synthesized by M-Medical Genenco-Life Science, Florence, Italy). Labeling of the probe and blotting were conducted as described in Dig-labeling and detection protocols (Boehringer-Mannheim, Mannheim, Germany). Briefly, RT-PCR products were separated in 1.2% agarose gel and transferred to a positively charged nylon membrane (ICN Biomedicals, Aurora, Ohio) by a vacuum blotter system (Bio-Rad Laboratories, Hercules, CA) for 2 h. After hybridization, the digoxigenin-labeled P2X7-specific internal oligoprobe was visualized by chemiluminescent detection after incubation with a dilution of anti-digoxigenin Fab conjugated to alkaline phosphatase. Cells were lysed in lysis buffer containing 300 mM sucrose, 1 mM K2HPO4, 1 mM MgSO4, 5.5 mM glucose, 20 mM HEPES (pH 7.4), 1 mM benzamidine, 1 mM PMSF, 0.2 μg of DNase, and 0.2 μg of RNase by repeated freeze/thawing (three cycles). Proteins were separated on a 7.5% SDS polyacrylamide gel according to Laemmli and blotted on nitrocellulose paper (Schleicher and Schüll Italia, Legnano, Italy). The rabbit polyclonal anti-P2X7 serum was raised against the synthetic peptide corresponding to the last 20 amino acids of the rat P2X7 protein (KIRKEFPKTQGQYSGFKYPY). The Ab was used at a dilution of 1:100 in TBS buffer (10 mM Tris-Cl and 150 mM NaCl (pH 8.0)). Secondary Ab was a goat anti-rabbit Ab conjugated to alkaline phosphatase. FSDCs were incubated in Iscove’s medium supplemented with mouse recombinant IFN-γ (Genzyme) at a concentration of 10 U/ml. After 24 h, they were seeded in flat-bottom microtiter plates (Corning Costar Italia, Concorezzo, Italy) at a concentration of 104/well, pulsed with OVA (1 mg/ml), and cocoltured with the DO11.10 hybridoma (5 × 104 cells) in a final volume of 200 μl/well. After an additional 24 h, aliquots of supernatants were harvested and frozen before measuring IL-2 content. CTLL-2 (104/ml) were extensively washed before being added to 100 μl of thawed supernatants (final volume 200 μl) and incubated 24 h. After this time, 1 μCi/well of [3H]thymidine (sp. act. 2.0 Ci/mMol) was added, and the incubation was conducted for a further 6 h. Incorporation of [3H]thymidine by CTLL-2 cells was measured by liquid scintillation counting. Pinocytosis was measured as described by Swanson et al. (26). Briefly, IFN-γ-treated FSDCs (106) were incubated with OVAFITC (Molecular Probes) 0.5 mg/ml for 1 h, washed three times with cold PBS (the first washing solution also contained 1 mg/ml BSA), and lysed with Triton X-100 (0.05%). Fluorescence was measured with an LS-50 Perkin-Elmer spectrofluorometer with reference to a standard curve and was normalized to the protein content of the samples. Analysis of expression of F4/80, B7, and IA molecules was performed with a cytometer equipped with a single argon laser (FACScan, Becton Dickinson, San Jose, CA) as previously described (2). Individual cell samples were incubated for 30 min in PBS supplemented with 2% FCS at 4°C with each mAb and then washed twice in PBS. Ten thousand events were acquired for each condition and analyzed with computer software (LYSIS II; Becton Dickinson). IL-1β in the supernatant of LPS (Sigma)-primed microglial cells was measured with the Intertest-1βX mouse ELISA kit (Genzyme) (8, 27). FSDCs were incubated in Iscove’s medium supplemented with mouse recombinant IFN-γ at a concentration of 10 U/ml. After 24 h, they were seeded in 24-well plates at a concentration of 105 cells/well, pulsed with OVA (1 mg/ml), and cocultured with the DO11.10 hybridoma (5 × 105 cells), in a final volume of 500 μl/well. After an additional 24 h, IL-2 in the supernatants was measured with the Intertest 2 mouse ELISA kit (Genzyme). The hallmark of the presence of a functional P2X7R is ATP-dependent permeabilization of the plasma membrane. Fig. 1⇓ reports one experiment that exemplifies at least ten similar showing that this response is also elicited in DCs, as judged by lucifer yellow uptake. All the three cell lines tested were readily and thoroughly permeabilized by ATP (cf. Fig. 1⇓, D, F, and H), although within several experiments repeated under the same experimental conditions, FSDCs showed the most consistent and reproducible response, with a percentage of permeabilized cells always over 80%. Note that, in some ATP-treated DCs, morphological alterations typical of P2X7 activation (plasma membrane blebbing) could also be detected (Fig. 1⇓, arrows). As a control, D2SC/1 cells incubated in the absence of ATP are shown in Fig. 1⇓, A and B. Control CB1 and FSDCs are not shown since they also were unambiguously impermeable to lucifer yellow in the absence of ATP. To confirm that plasma membrane permeabilization was specifically dependent on P2X7R expression, we selected a number of ATP-resistant cell clones from D2SC/1, CB1, and FSDCs. Response to ATP of one such clone, which exemplifies all the others, is shown in Fig. 2⇓, A and B. At variance with the wild-type DCs, this clone showed neither ATP-dependent lucifer yellow uptake nor plasma membrane blebbing. There is as yet no good selective antagonists of the P2X7R; however, a compound that has proved useful when used in relatively low concentrations is oATP (23, 28). This dialdehyde reagent covalently binds the P2X7R and fully inhibits all P2X7-dependent changes, among which is lucifer yellow uptake (Fig. 2⇓, C and D). Another useful kinetic parameter of the opening of the ATP-gated pore is ethidium bromide uptake. This cationic fluorescent dye easily permeates through the ATP-activated pore and binds to the nucleus, thus giving a fluorescence increase. Fig. 3⇓ shows that ATP causes a slow and steady ethidium bromide uptake in wild-type D2SC/1 cells, but not in the ATP-resistant clone D2SC/1R9. Similar results were also obtained with CB1 and FSDCs (not shown). ATP causes permeabilization of DC plasma membrane. DCs, 3 × 105/well, were plated overnight in 24-well culture dishes. 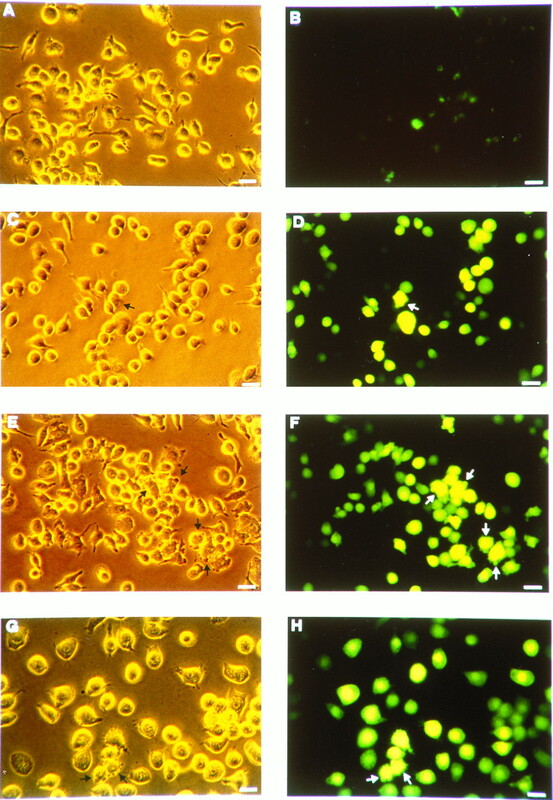 Culture medium was rinsed and replaced with Ca2+-free warm (37°C) saline solution containing 1 mg/ml of lucifer yellow and 250 μM sulfinpyrazone, either in the absence (A and B) or in the presence (C-H) of 3 mM ATP. After 15 min, the ATP-containing solution was removed, and monolayers were rinsed twice with serum-containing culture medium and photographed with a ×40 objective. A and B, D2SC/1 cells incubated in the absence of ATP; C and D, E and F, and G and H refer to D2, CB1, and FSDC cells, respectively, incubated in the presence of ATP. A, C, E, and G, Phase contrast; B, D, F and H, fluorescence. Bar = 25 μm. DCs selected for ATP resistance or pretreated with oATP do not permeabilize in response to ATP. Monolayers were plated and challenged with ATP as described in Fig. 1⇑. A and B, ATP-resistant clone D2SC/1R9. 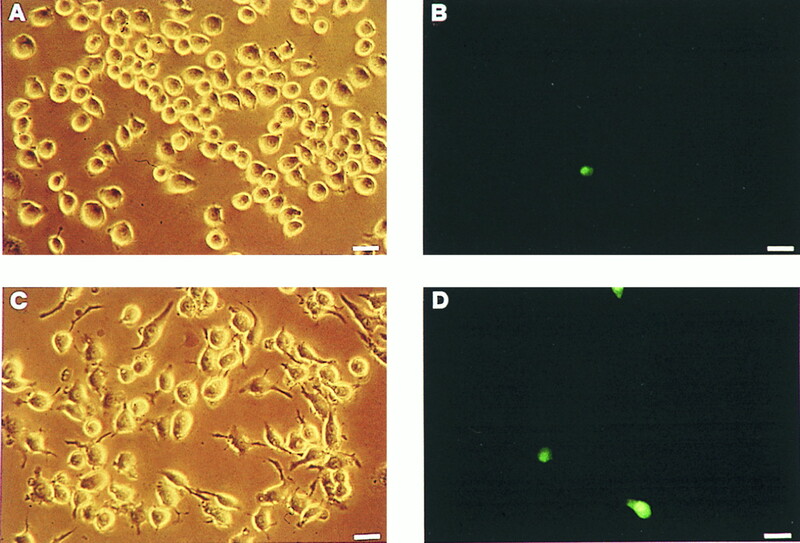 C and D, Wild-type D2SC/1 cells pretreated for 2 h with 300 μM oATP, rinsed, and stimulated with ATP. A and C, Phase contrast; B and D, fluorescence. Bar = 25 μM. ATP causes ethidium bromide uptake in DCs. DCs were incubated in standard saline in a magnetically stirred fluorometer cuvette (37°C) in the presence of 20 μM ethidium bromide. ATP was 1 mM and digitonin (Dig) 100 μM. 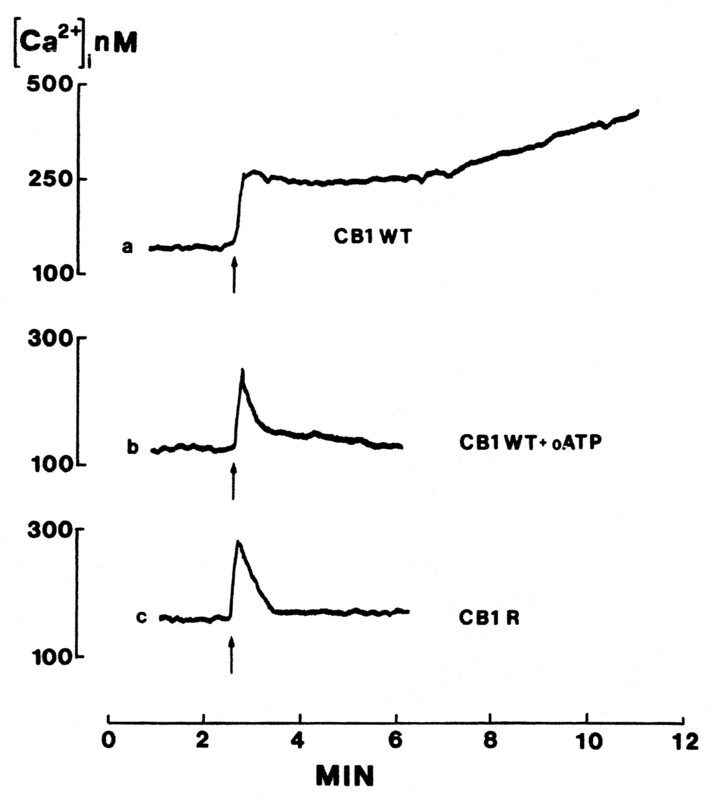 ATP stimulation causes an increase in the cytoplasmic Ca2+ concentration ([Ca2+]i) via a dual mechanism: 1) a fast release of Ca2+ from intracellular stores mediated by P2Y receptors and 2) a slower influx from the extracellular milieu mediated by P2X7R. Fig. 4⇓ shows that ATP addition (arrow) caused in wild-type CB1 cells (trace a) the anticipated fast [Ca2+]i rise followed by the slow delayed increase. In agreement with previous results (23), only the slow, delayed phase was inhibited by oATP (trace b), whereas the early and fast [Ca2+]i transient was unaffected. This selective inhibition of [Ca2+]i increase reflects selectivity of oATP for the P2X7R as opposed to members of the P2Y subfamily. In support of the conclusion that oATP-inhibitable [Ca2+]i rise corresponds only to the late transmembrane Ca2+ influx through the P2X7R/channel, this delayed phase lacked in P2X7less clones (see trace c); thus the kinetic of the [Ca2+]i increase in the presence of oATP overlapped with that observed in ATP-resistant CB1 cells. ATP triggers a biphasic [Ca2+]i rise in wild-type but not in ATP-resistant or oATP-inhibited DCs. DCs (106/ml) were incubated in standard saline in a fluorometer cuvette (37°C) and stimulated with 1 mM ATP (arrows). To confirm expression of the P2X7R, we performed an RT-PCR amplification using specific primers and an internal probe designed by Dr. Gary Buell (Serono Pharmaceutical Research Institute, Geneva, Switzerland). Fig. 5⇓ shows the amplification product of FSCDs (lane 2) compared with that of a clone of mouse J774 macrophages selected for an enhanced expression of this (P2Z/P2X7 hyper; see 13). Rather surprisingly, FSDCs appear to express P2X7 to a level even higher than the P2Z/P2X7 hyper J774 clone. Expression of the P2X7 transcript in a P2Z/P2X7hyper J774 macrophage clone and in FSDCs. Total RNA was extracted as described in Materials and Methods and used for RT-PCR. Ten or 5 μl of PCR product were loaded in each lane for P2X7 or β-actin, respectively. Detection of PCR fragments was performed by transfer to nylon membrane and hybridization with a specific internal probe. Lane 1, P2Z/P2X7hyper J774 clone; lane 2, FSDCs. Recently, specific Abs raised against the rat P2X7R have become available (7, 13, 29). Fig. 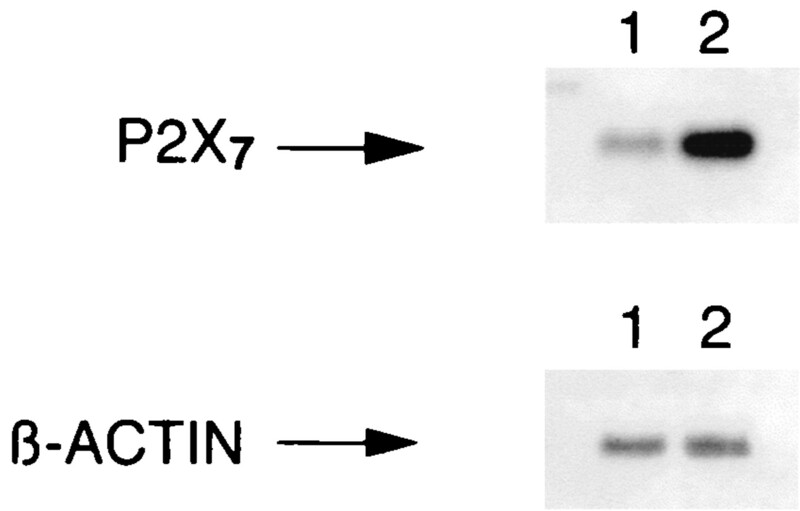 6⇓ (upper panel) shows an immunoblot of ATP-sensitive and -resistant DCs stained with a specific polyclonal Ab raised against the terminal COOH sequence of the rat P2X7R. 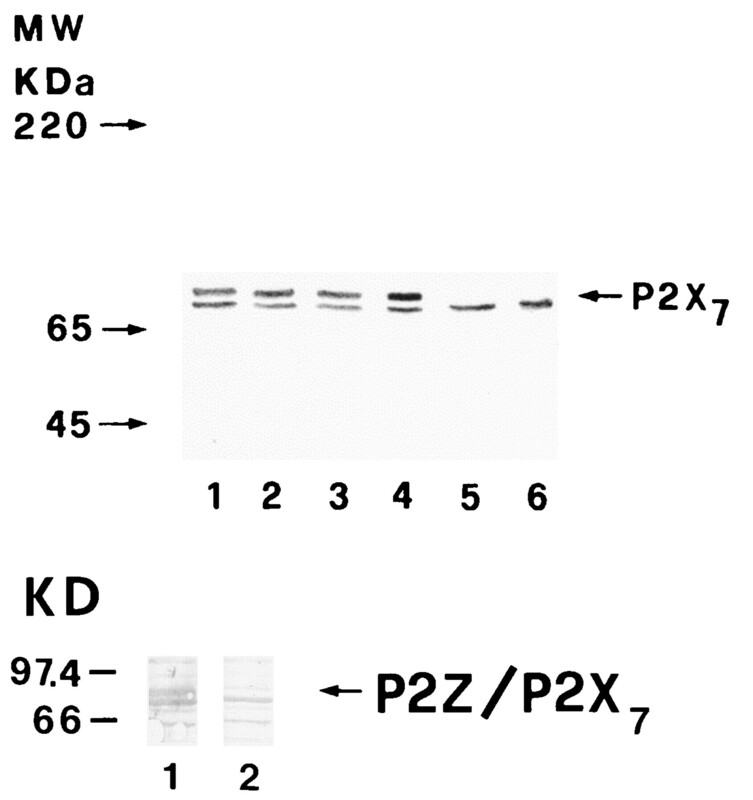 The three DC lines were clearly positive for P2X7 (upper band; lower band corresponds to an unidentified cross-reacting protein), while the clones selected for ATP resistance were negative, confirming results previously obtained in macrophage and microglial cell lines (7, 13). A blocking experiment performed with the specific peptide used for immunization confirmed the identification of the upper band as the P2X7 protein (Fig. 6⇓, lower panel). A specific anti-P2X7 Ab stains a 70-kDa protein, in D2, CB1, and FSDC cells, that is absent in ATP-resistant cells. Proteins (30 μg/lane) extracted as described in Materials and Methods were separated by electrophoresis and transferred to nitrocellulose. Upper panel, anti P2X7 Ab was visualized with a goat anti-rabbit secondary Ab conjugated to alkaline phosphatase. Lane 1, J774 mouse macrophages used as controls; lane 2, CB1; lane 3, D2SC/1; lane 4, FSDC; lane 5, ATP-resistant D2SC/1; lane 6, ATP-resistant FSDCs. Lower panel, blocking of the anti-P2X7 Ab with the KIRKEFPKTQGQYSGFKYPY peptide. Lane 1, staining with the anti-P2X7 Ab; lane 2, staining with the anti-P2X7 Ab preincubated for 2 h with the blocking peptide at a concentration of 20 μg/ml. As pointed out above, the physiological meaning of the P2X7R is unknown. However, we were intrigued by the observation that this receptor is mainly expressed in cells that are either facultative or professional APCs (see Ref. 9 for a recent review). Furthermore, IFN-γ, which is known to increase Ag-presenting activity, causes P2X7 up-regulation, and, among the three cell lines investigated in the present study, FSDCs, which have the higher Ag presenting activity (P. Ricciardi-Castagnoli, unpublished results), are also more consistently and more thoroughly permeabilized by ATP. Thus, we investigated the ability to stimulate Ag-specific TH lymphocytes in Ag-pulsed DCs that were either pretreated with oATP or were selected for lack of P2X7. As shown in Fig. 7⇓, preincubation with oATP significantly reduced Ag-presenting activity of FSDCs, as judged by ability to trigger IL-2 secretion from syngeneic T helper lymphocytes. At the optimal oATP concentration of 300 μM, Ag-presenting activity (open squares) was reduced by 40%, whereas a little larger inhibition was obtained by increasing the oATP concentration to 600 μM. One reason for reduced Ag-presenting activity could be a decrease in Ag endocytosis. However, we think that this is not the case, since, especially at the optimal oATP concentration of 300 μM, uptake FITC-OVA was marginally affected (Fig. 7⇓; filled circles), thus ruling out the possibility that decreased efficiency in Ag presentation could be accounted for by inhibition of Ag uptake. We extended the observations in FSDCs to ex vivo DC from mouse bone marrow. Primary DCs were pulsed with OVA, as described in Materials and Methods, and cocultured with the DO11.10 hybridoma. As shown in Fig. 8⇓, preincubation in the presence of oATP reduced Th cell activation also in this case, suggesting that the effect of the inhibitor was not restricted to a virally transformed cell line such as FSDCs. oATP inhibits Ag-specific stimulation of TH lymphocytes. FSDCs were incubated in the presence of OVA and the DO11.10 hybridoma as described in Materials and Methods. After 24 h, supernatants were withdrawn and added to IL-2-starved CTLL-2 cells, and thymidine incorporation (left ordinate) was measured. Basal thymidine incorporation in the absence of added supernatants was about 1000 cpm. Supernatants from hybridoma cells incubated in the presence of FSDCs but in the absence of OVA did not stimulate thymidine incorporation over basal levels. In parallel experiments, pinocytosis of OVA-FITC was also measured (right ordinate) (see Materials and Methods). Data are means ± SD of sextuplicate determinations of one representative experiment repeated four times. oATP inhibits Ag-specific stimulation of TH lymphocytes by primary DCs. DCs were seeded in 24-well plates at a concentration of 105 cells/well, pulsed with OVA (1 mg/ml), and cocultured with the DO.11.10 hybridoma (5 × 105 cells/well) (open bar). In parallel experiments, they were also pretreated for 2 h with either 300 (hatched bar) or 600 (filled bar) μM oATP. IL-2 release was measured as described in Materials and Methods. Data are triplicate determinations (± SD) from one experiment repeated in three different occasions. Values of IL-2 release from DO11.10 lymphocytes in the presence of OVA-pulsed DCs were statistically significant (p < 0.05, Student’s t test) when compared with IL-2 release from DCs plus DO11.10 cells (no OVA)and to IL-2 release from DCs plus OVA and DO11.10 cells in the presence of either 300 or 600 μM oATP. Although oATP is a good blocker of P2X7R, especially in the 100–300 μM range, it cannot be excluded that other surface ATP-binding sites are also affected by this ligand, e.g. ecto-kinases or ecto-ATPases (23, 30), and thus the inhibitory effect might be due to other factors besides P2X7R blockade. To circumvent this drawback, we tested Ag-presenting activity of ATP-resistant clones, three of which are shown in Fig. 9⇓. ATP-resistant FSDC cells had a TH stimulating activity strongly reduced (more than 80%) as compared with the wild type. ATP-resistant FSDCs are poor stimulators of TH lymphocytes. 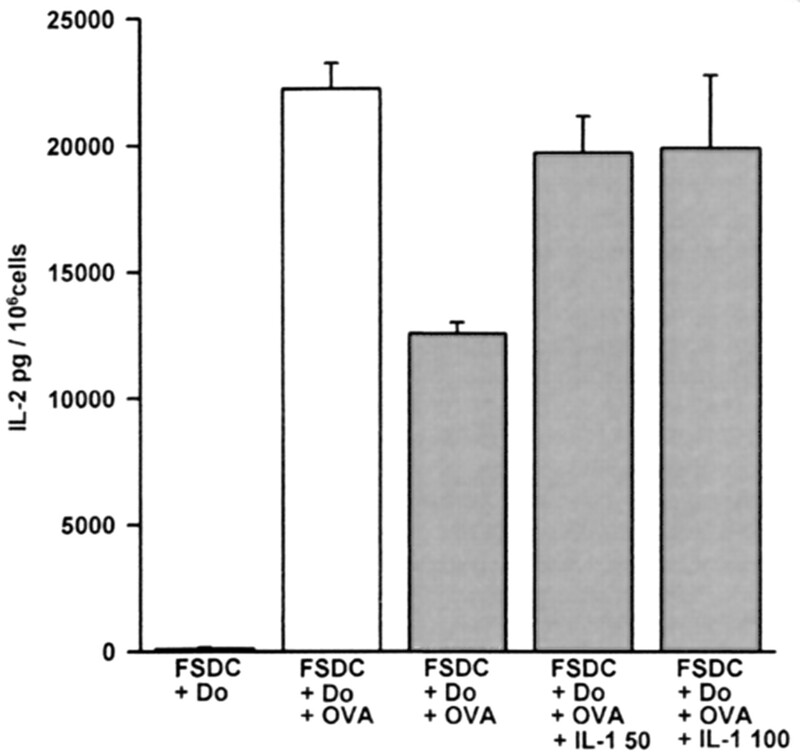 Wild-type and ATP-resistant FSDC were incubated in the presence of OVA and the DO11.10 hybridoma as described in Fig. 7⇑ and in Materials and Methods. Supernatants were withdrawn and added to IL-2-starved CTLL-2 lymphocytes. 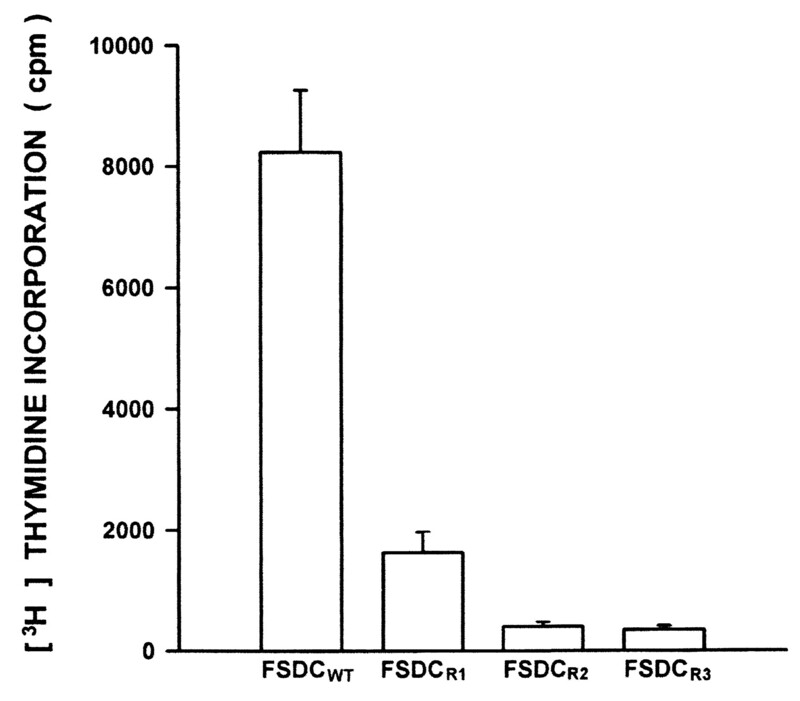 Thymidine incorporation of CTLL-2 cells incubated with supernatant from wild-type FSDCs is shown by the bar labeled FSDCWT, while thymidine incorporation of CTLL-2 cells incubated with supernatants from three different ATP-resistant FSDC clones is shown by bars labeled FSDCR1, FSDCR2, and FSDCR3. Data are means ± SD of sextuplicate determinations of one representative experiment repeated three times. At the present stage, we cannot provide a straightforward explanation for reduced stimulatory activity of P2X7less and oATP-inhibited wild-type FSDCs. It is possible that ATP-resistant, P2X7less DCs are impaired in their endocytosis, and consequently in the ability to present the Ag, but we did not find any decrease in the uptake of OVA-FITC by these cells as compared with the wild type (not shown). Another obvious factor affecting Ag presentation could be a reduced expression of MHC-II or accessory molecules (e.g., B7-2) by ATP-resistant FSDCs. However, this does not seem to be the case, as shown by FACS analysis in Fig. 10⇓. FACS analysis of F4/80 Ag, B7-2, and MHC-II (I-A) expression by wild-type and ATP-resistant FSDCs. A, F4/80; B, B7-2; C, I-A. Given the well-documented involvement of P2X7R in IL-1β release (8, 27, 31, 32), another reason for the faulty stimulation of TH lymphocytes could be deficient release of this cytokine. To test this possibility, we measured IL-1β content of supernatants from wild-type and ATP-resistant (P2X7less) FSDCs cocultured with TH lymphocytes. Fig. 11⇓ shows that FSDCs coincubated for 24 h with TH lymphocytes released a significant amount of IL-1β (about 170 pg/106 cells). Very interestingly, cytokine release was reduced by about 70% in the ATP-resistant variant. Reduced IL-1β release in response to challenge with TH lymphocytes was observed with different ATP-resistant FSDC clones as APCs. ATP-resistant FSDCs show reduced IL-1β release in response to stimulation with TH lymphocytes. Wild-type and ATP-resistant FSDCs were incubated in the presence of OVA and either in the presence or absence of DO11.10 hybridoma according to the standard Ag presentation protocol detailed in Materials and Methods. After 24 h, supernatants were withdrawn and assayed for IL-1β content. Data are duplicates of one experiment repeated three times. An implication of these experiments is that addition of exogenous IL-1β should restore Ag-presenting function of oATP-inhibited FSDCs. Fig. 12⇓ shows that this is indeed the case, since supplementation of the incubation medium with IL-1β (100–150 pg/ml) restores the ability of oATP-inhibited FSDCs to stimulate the DO11.10 hybridoma. Addition of exogenous IL-1β reverts oATP-dependent inhibition of TH lymphocyte stimulation. Experimental conditions were as described in Fig. 7⇑, with the exception that, when indicated, IL-1β was added at the beginning of the coculture at a concentration of 50 and 100 pg/ml, respectively (open bars, no oATP; hatched bars, 600 μM oATP). Data are triplicate determinations (± SD) from one experiment repeated in three different occasions. 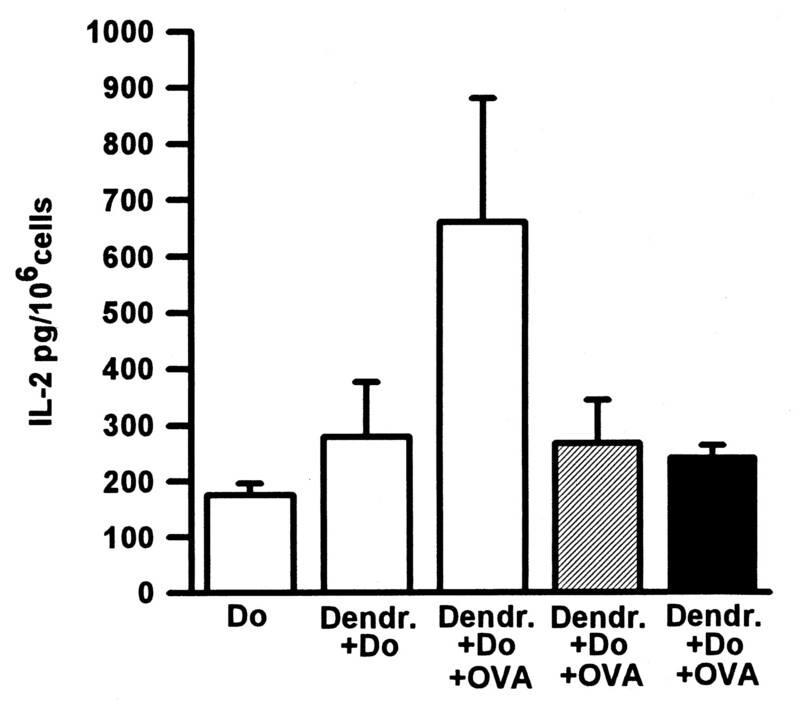 Decrease of IL-2 release from DCs incubated in the presence of OVA, DO11.10 cells, and oATP was statistically significant (p < 0.01, Student’s t test) when compared with parallel samples incubated in the absence of oATP, or stimulated with 50 or 100 pg/ml IL-1β. It has been known for some time that immune cells respond to stimulation with extracellular ATP (8, 9, 33). 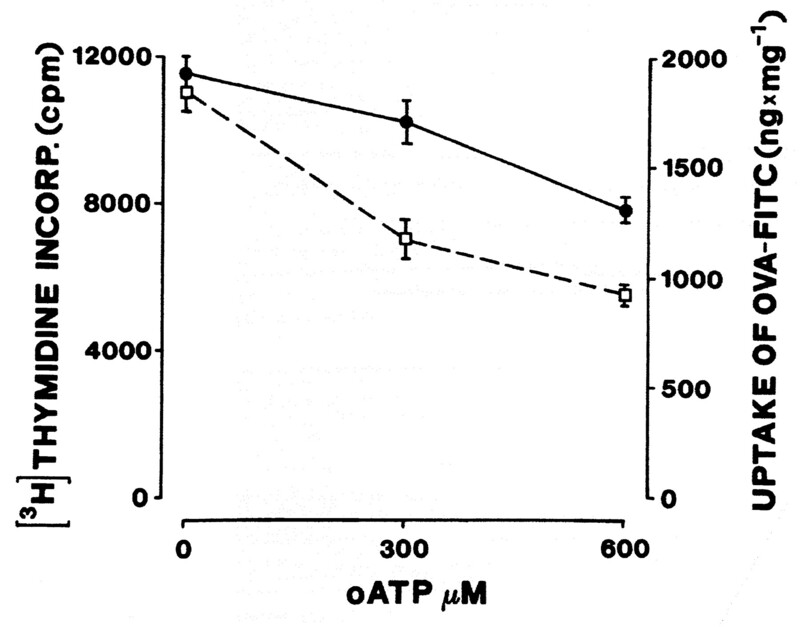 In mononuclear phagocytes, ATP stimulation causes a drastic increase in plasma membrane permeability to low m.w. aqueous solutes that, for brief ATP applications, is fully reversible. This peculiar response to ATP is due to expression of the P2X7R, the latest member of the purinergic P2XR subfamily to be cloned. Whereas Northern blot data suggest that mRNA for P2X7 might be present in many different tissues (pancreas, liver, skeletal muscle, lung, placenta, testis, and spleen) (11), functional responses unequivocally diagnostic of this receptor have been recorded only from macrophages (but not monocytes) (1, 2), Langerhans cells (14), mast cells (34) and microglial cells (8). In a few instances also cells of epithelial origin have been reported to undergo plasma membrane permeability changes typical of the P2X7R (35). The function of this receptor is unknown, although it has been tentatively associated to at least three responses central to inflammation: cytotoxicity, cytokine secretion, and formation of multinucleated giant cells (8). Cytotoxicity is one of the most striking consequences of sustained stimulation with ATP in many cell types. Macrophages, microglial cells, mast cells, and DCs are readily killed by ATP in the 100-μM or -mM range (8, 36). Some lymphocyte subpopulations are also sensitive to ATP-mediated cytotoxicity (37, 38). Cell death is strictly dependent on expression of the P2X7R, although it has been suggested that P2X1 may also confer sensitivity to ATP (39). The intracellular mechanism clearly involves Ca2+ and Na+ overload and K+ depletion as early signals, but then several other deadly pathways are likely to be recruited, including caspases (J. M. Sanz and F. Di Virgilio, manuscript in preparation). The ability of P2X7R to trigger caspase activation lends further ground to the documented proapoptotic action of extracellular ATP (8). Related to caspase activation is the ability of extracellular ATP to release IL-1β in its mature form. It is a long-standing observation that macrophages and microglial cells, as opposed to circulating monocytes, are poor producers of IL-1β in response to stimulation with bacterial endotoxin: these cells require much higher stimulant concentration and the release kinetic is very slow (40). However, addition of ATP to LPS-pretreated macrophages or microglial cells triggers a massive and rapid cytokine release (8, 27, 31, 32). This effect is specifically mediated via sequential activation of P2X7 and caspase-1 (ICE). In the absence of prestimulation with LPS, ATP is unable to cause IL-1β secretion, indicating that this nucleotide by itself cannot induce transcription of the IL-1β gene. Macrophages that express the P2X7R to a high level or non-macrophage cell lines transfected with P2X7 cDNA, fuse spontaneously in culture, and this fusion is blocked by oATP (2, 13). Cell fusion is an important event during granulomatous inflammation that leads to the formation of polykarions containing up to several tens of nuclei. Monocyte-derived human macrophages may also be triggered to fuse in in vitro culture upon stimulation with Con A or PHA (2, 41), especially if the culture contains some residual lymphocytes. Also, in this case, fusion is blocked by preincubation with oATP. Following these observations, another role that has been suggested for the P2X7R is in multinucleated giant cell formation during granulomatous reactions (8). Although all these P2X7-linked responses are well documented, it is obviously intriguing that this receptor is especially expressed by APCs and its expression is up-regulated by IFN-γ, a cytokine that is known to have a potent proinflammatory activity and to increase Ag presentation. Furthermore, professional APCs typically express a very high nucleotidase activity associated with the external surface of the plasma membrane (14), whose function is mysterious. Taken together these findings may suggest that purines acting at the surface of DC plasma membrane may participate in the process of Ag presentation. Ag presentation by professional or facultative APCs is a highly organized response involving Ag uptake, processing, and association to MHC II molecules. In the context of class II MHC complex, the Ag is recognized by the TCR of helper T lymphocytes, thus driving T cell activation and effector functions. This is a bidirectional communication whereby the APC sends a stimulatory message to the lymphocyte and vice versa the lymphocyte feeds back on the APC. Interaction of DCs with T helper lymphocytes is aided by costimulatory molecules, such as B7 and CD40, that are especially important for activation of naive lymphocytes and secretion of soluble factors (42). Inhibition of DC P2X7R with oATP drastically decreases the ability to stimulate syngeneic TH lymphocytes without significantly reducing Ag uptake. The possibility that oATP exerts its action on the T lymphocytes can be ruled out since (and this is one of the advantages of this covalent blocker) incubation medium is changed after the standard 2-h incubation of DCs with oATP, and before addition of the T lymphocytes. Furthermore, P2X7less cell clones selected from wild-type FSDCs were also unable to activate TH cells, suggesting that the faulty stimulation observed in oATP-inhibited DCs was not due to a nonspecific toxic effect. At this early stage it is difficult to provide a clear mechanistic interpretation of the participation of P2X7 in Ag presentation. Yet, we think that an easy and logical explanation can be offered on the basis of the known relationship between P2X7R and IL-1β. It is documented that macrophage or microglial cells lacking a functional P2X7R are unable to secrete mature IL-1β (27), albeit cytoplasmic accumulation of the pro-cytokine is normal. This failure is probably due to inability of P2X7less cells to trigger ICE activation, the key step in IL-1β processing and release. The molecular mechanism of ICE/caspase-1 activation via purinergic receptors is yet to be determined, but there is hint that cytoplasmic K+ depletion could be involved (27). Thus, we think that a likely explanation for the poor TH cell-stimulating activity of P2X7less and oATP-inhibited cells resides in their inability to release a sufficient amount of IL-1β. Restoration of TH cell-stimulating activity by exogenous IL-1β supports this interpretation. A similar mechanism has been suggested to explain failure of carcinogen-altered DC to initiate T cell proliferation (43). The permeabilizing P2X7 ATP receptor for many years has been thought of as little more than a curiosity. Nonetheless, observations published over the last 3 yr by different laboratories are starting to unveil its physiological role, anticipating for this intriguing plasma membrane molecule an important place in the growing family of immunomodulatory/costimulatory receptors. We thank Dr. Gary Buell (Serono Pharmaceutical Research Laboratories, Geneva, Switzerland) for advice. ↵1 This work was supported by the Italian Ministry for Scientific Research (40% and 60%), the National Research Council of Italy (Target Project on Biotechnology), the Italian Association for Cancer Research (AIRC), the X AIDS Project, and the II Tuberculosis Project and Telethon of Italy. ↵3 Abbreviations used in this paper: DC, dendritic cell; FSDC, fetal skin-derived DC; oATP, oxidized ATP; [Ca2+]i, cytoplasmic free Ca2+ concentration; ICE, IL-1β-converting enzyme. de la Salle, H., J. Galon, H. Bausinger, D. Spehner, A. Bohbot, J. Cohen, J-P. Cazenave, C. Sautes, D. Hanau. Soluble CD16/FcγRIII induces maturation of dendritic cells and production of several cytokines including IL-12. Adv. Exp. Med. Biol. 417:345.